The Narrative Breakdown is by editor Cheryl Klein and video editor and director James Monohan. They discuss storytelling tips and techniques. It was interesting hearing them discuss scene construction using examples from movies and books. If you want to learn more about the podcast and how it came about, check out Narrative Breakdowns, Muggles Editing, Getting a Job, Overseas Travel, and Lovely Links over at Brooklyn Arden. 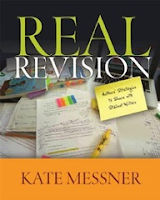 Also this week I came across author Kate Messner's Pinterest board What Revision Looks Like. I haven't had time to do much poking around here, but there are author interviews on revision, revision tips and even examples of marked up manuscripts. I haven't read her book, Real Revision, but I'd like to one day. I hear it's useful to writers as well as teachers. Oh, I love Cheryl Klein so I've book marked this so I can listen to her talk when I have a chance. Thanks Andrea. I peeked on the revision one. Oh. Wow! If we try to query with a ms that needed that much editing, we would be facing rejections. Thanks for the links, going to look at them now.